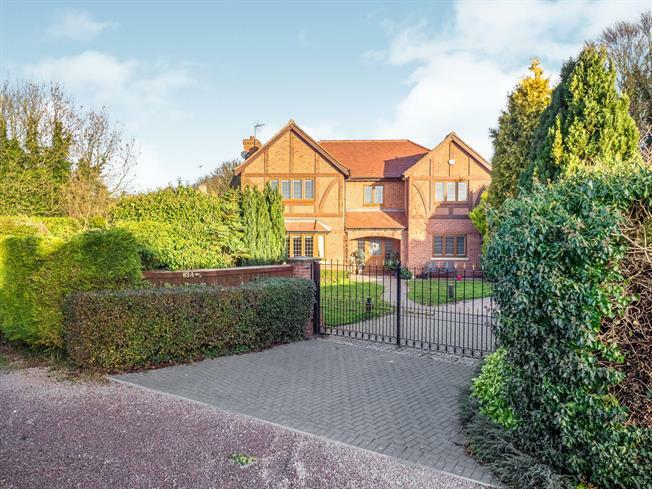 5 Bedroom Detached House For Sale in Nottingham for Offers in the region of £750,000. Situated on a quiet private road away from Main Road itself this Executive Family Home sits proudly in its plot behind electric gates. Offering a dynamic approach to family living there is not much more you could want. In brief the accommodation comprises; Entrance Hall, Modern Kitchen/Diner with Utility, Lounge, Games Rooms, Dining Room and Downstairs WC. Upstairs is a generous Master Suite with Dressing Room and En-Suite Shower Room. Second Double with an En-Suite and a further Three Double Bedrooms. To the side of the property is what was a triple garage that has been converted to a single Garage, Home Gym and Home Office. With fantastic potential to suit your own needs. To the rear of the property is a lean to conservatory currently housing a hot tub. Externally there are ample gardens mainly laid to lawn and secure driveway parking. UPVC front double glazed door. Double glazed uPVC window with leaded glass facing the front. Underfloor heating, engineered wood flooring, under stair storage, spotlights and feature light. UPVC French double glazed door, opening onto the patio. Double glazed uPVC window facing the rear. Underfloor heating, tiled flooring, ceiling light. Stone work surface, fitted and wall and base units, one and a half bowl sink and with mixer tap, freestanding, range oven, over hob extractor, integrated standard dishwasher, integrated washing machine, fridge/freezer. Double glazed uPVC window with leaded glass facing the side. Underfloor heating, tiled flooring, ceiling light. Granite effect work surface, fitted and base units, one and a half bowl sink. Double glazed uPVC bay window facing the front. Electric fire and underfloor heating, carpeted flooring, ceiling light. Double glazed uPVC window with leaded glass facing the front. Underfloor heating, engineered wood flooring, ceiling light. UPVC patio double glazed door, opening onto the garden. Double glazed uPVC window facing the rear and side. Underfloor heating, carpeted flooring, ceiling light. Underfloor heating, tiled flooring, ceiling light. Low level WC, vanity unit, extractor fan. Double glazed uPVC window with leaded glass facing the front. Radiator, carpeted flooring, ceiling light. Double glazed uPVC window with leaded glass facing the rear. Radiator, carpeted flooring, sliding door wardrobe, ceiling light. Double glazed uPVC window with leaded glass facing the front. Radiator, engineered wood flooring, ceiling light. With Dressing room leading to En- suite. Double glazed uPVC window with obscure glass facing the side. Heated towel rail, tiled flooring, spotlights. Low level WC, double enclosure shower, vanity unit and double sink, extractor fan, shaving point and bidet. Double glazed uPVC window with obscure glass facing the side. Heated towel rail, carpeted flooring, ceiling light. Low level WC, single enclosure shower, pedestal sink, extractor fan and shaving point. Air conditioning, carpeted flooring, built-in storage cupboard, ceiling light. Double glazed uPVC dormer style window with leaded glass facing the front. Air conditioning, carpeted flooring, spotlights.